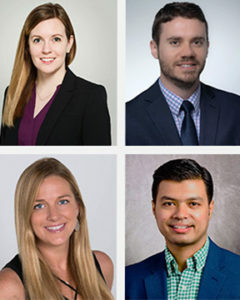 The American Academy of Optometry Foundation (AAOF) has announced that four UHCO researchers – Maria Walker, OD, MS, FAAO; Gareth Hastings, BOptom; Suraj Upadhyaya, OD, FAAO; and Laura Pardon, OD, MS, FAAO – have been selected as recipients of the 2018 William C. Ezell Fellowships. They were among a total of 13 recipients awarded this year. Dr. Walker was recognized as the Ezell Fellow for the AAO Section on Cornea, Contact Lenses, and Refractive Technologies. Dr. Upadhyaya became the Baycross Christian Family Foundation Binocular Vision and Pediatrics Ezell Fellow. Hastings was named the American Academy of Optometry Foundation Earl L Smith, III Ezell Fellow. Dr. Pardon was recognized as the Optometric Glaucoma Society Ezell Fellow. The Ezell Fellowship Program is named after the founding President of the AAOF, William C. Ezell, OD, and recognizes individuals pursuing an advanced degree in optometric research and provides education recognition and support. 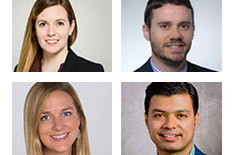 This year’s Ezell Fellows will be honored at the AAOF’s annual celebration luncheon on Nov. 10, 2018, during the AAO’s annual meeting, in San Antonio, TX.